Here are my favorite DIY projects of the week. Hope you're inspired to try one of them this weekend! 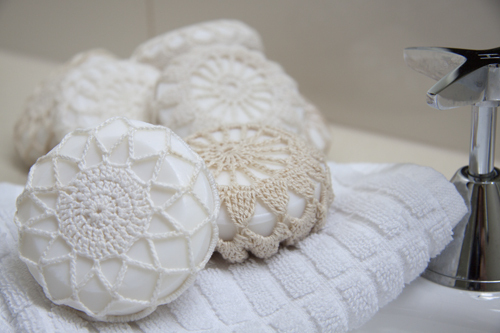 Love the vintage style of these doily-covered soaps via Dollar Store Crafts. I can picture a whole shallow bowl of them as killer bathroom decor. 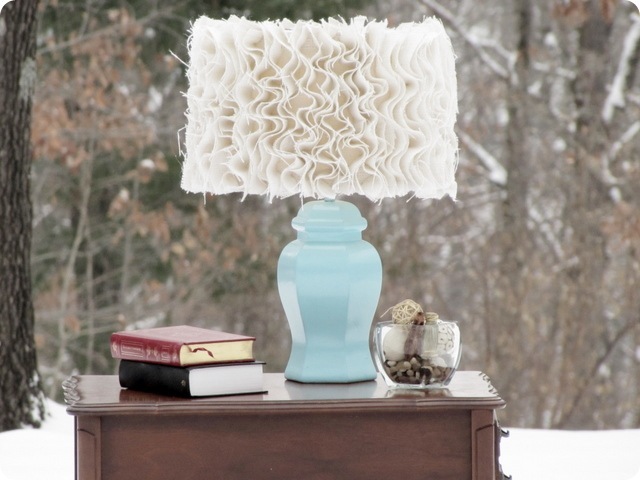 Over at Tatertots and Jello, Terra from Mama Says Sew created this Anthropologie-inspired ruffled burlap lamp. I love it with that blue base! For those of you with little ones (or those of you who just love to color! 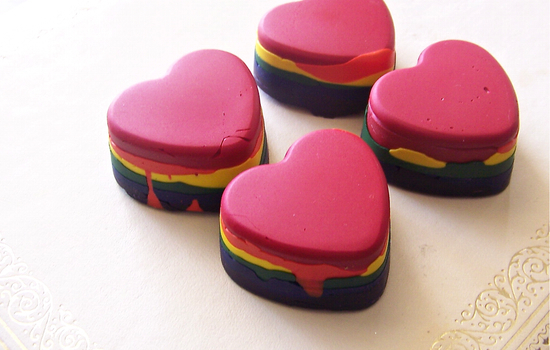 ), these rainbow crayons by Alex of the Alex Keller Studio look like such a fun project, especially when you think of all the color combinations you could choose. Find her tutorial over at papernstitch. If you're a serious camper (or a seriously finicky eater when it comes to how your food is flavored), this ingenious idea from The Handy Hausfrau makes taking your favorite spices with you a cinch. You can even download her labels, which she Mod Podged onto the top of each compartment. 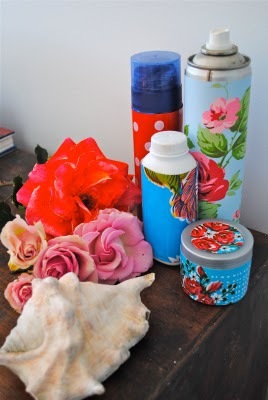 Simone over at Beach Vintage had the great idea to make your toiletries a little less of an eyesore by covering them with scraps of paper and fabric. 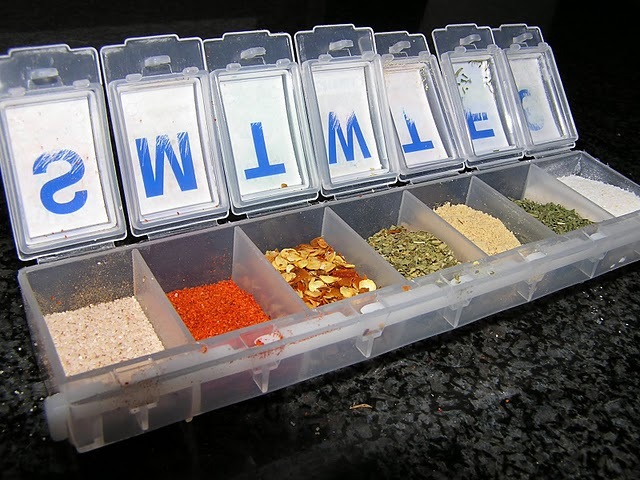 I love this idea, especially when you don't have enough bathroom storage to keep these things off the counter. 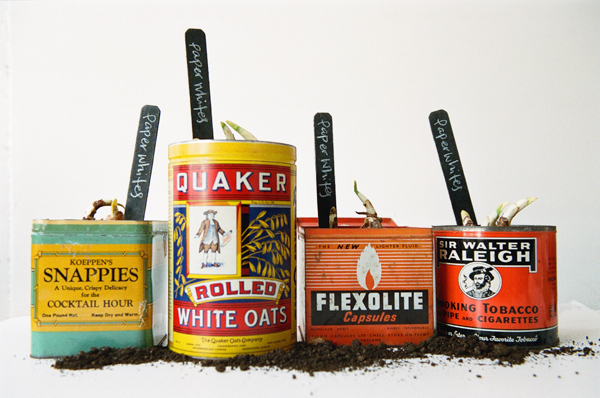 This is one of my favorite uses of old tin cans that I've already tried and loved the results. These particular ones are a DIY idea from OnceWed for wedding favors, which I think is a really cute idea. Lastly, wouldn't you love to have a wall like this in your house? Well, you can! 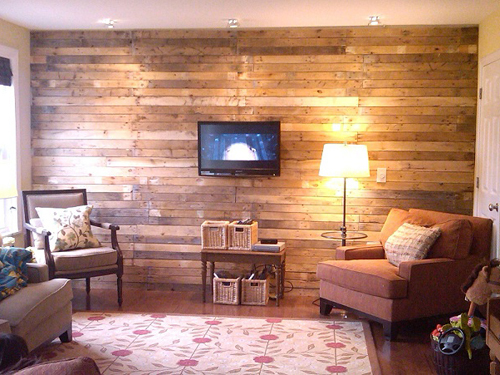 Katy of Mom and Her Drill posted this plank wall DIY over at Poppytalk, and it's made from scrap wood pallets! Nice.